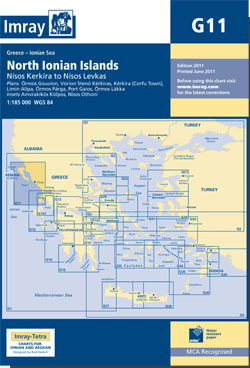 The northern Ionian islands from Nsos Kerkira to Nsos Levkas. Scale: 1 : 182,400. Insets of Amvrakikos Kolpos and Nsos Othonoi. Larger scale plans of Vorion Steno Kerkiras, Ormos Gouvrion, Limin Alipa, Limin Kerkiras, Ormos Lakka, and Limin Paxon.